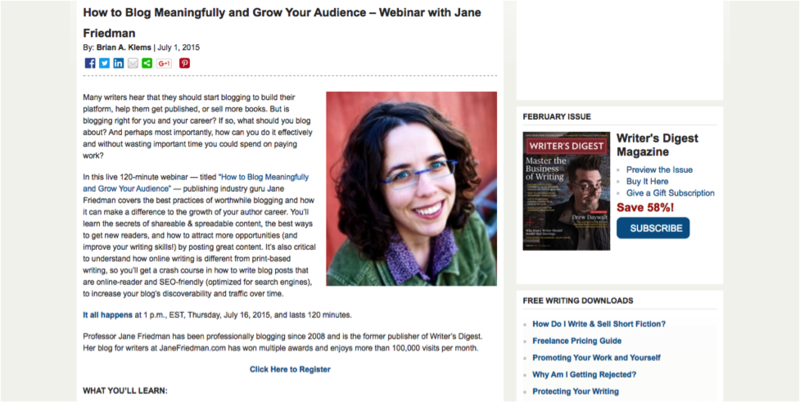 Webinars are pretty incredible when you think about it. Not too long ago the mere act of getting more than two people on a phone call was a daunting task, now people can watch a speaker’s full presentation from anywhere in the world. The combination of audio, video, and a presumably captivating host make webinars an incredibly valuable tool for any company. In fact, 60% of marketers said they try and incorporate webinars into their marketing strategies. However, it’s all too common to dedicate a ton of work developing and planning the event only to have an underwhelming number of people in attendance. No matter what you hope to achieve with a webinar, one of your goals should always be to maximize attendance. This post will show you how to choose a topic, promote it, and convert anyone that is interested so that you can reap the full benefits of your efforts. Do not – I repeat – do not even think about moving ahead in the planning process before you have researched, vetted, and chosen a topic to cover. The topic is the foundation upon which every other aspect of the webinar is based, so not devoting enough time or energy to it is like starting a book report without reading the first page. A good topic is one that will not only keep the audience engaged for the entire duration but is also broad enough to attract a big crowd while remaining relevant. Instead of making assumptions about what people want to learn, go out and ask them. Leverage social media as you take the first step in finding a worthwhile topic. Remember, you’re after attendance, so something that is constantly being talked about across your industry might be better than something you came up with yourself. If don’t regularly monitor what your followers are saying, now is the time to start scanning your brand mentions and any relevant hashtags to see if there is a topic that keeps getting repeated. While you’re at it, don’t be afraid to ask for ideas on forums or Quora. You might be surprised by what you learn. One of the best ways to get topic ideas is to survey visitors on your website directly. Use a survey tool like Qualaroo to start collecting responses. If you put that into BuzzSumo, it’s going to give you a list of similar pieces of content and show you how many times each has been shared. After you have done this for each one of your potential topics, use the total shares to determine which one has the most promise. Once you have a topic that resonates with your users and has been validated by existing content, you want to finalize the title so that you can begin to promote it, design graphics, and create some general awareness. The trick here is to not get too specific or you will risk limiting the number of people that the topic appeals to – always opt to go broad in hopes of attracting as many people as possible. 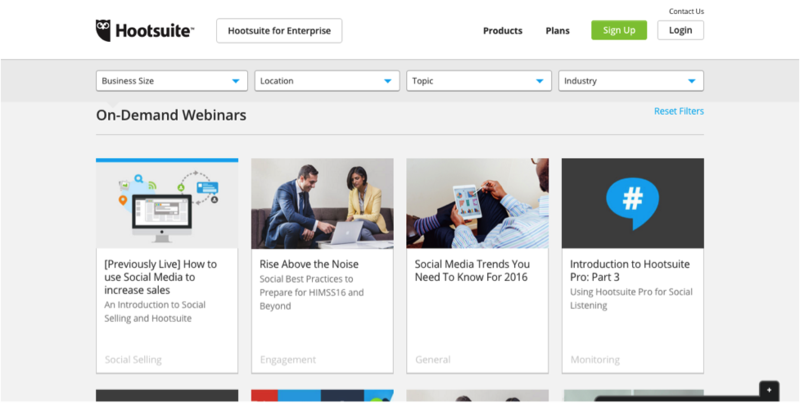 Look at some of the past webinars from Hootsuite. With the exception of the “Introduction to Hootsuite,” the rest have very general names. Take the first one, “How to use Social Media to increase sales.” They opted not to focus on one platform like Twitter because they realized talking about social media as a whole would attract more visitors. If you can avoid getting too specific with your titles then you will have a much higher chance of attracting a large audience. Ok, so you’ve got a topic and a killer title, time to find a speaker who is both knowledgeable and capable of contributing some name recognition. Ideally, this person already exists within your company, but if not it’s easy enough to find some suitable candidates. 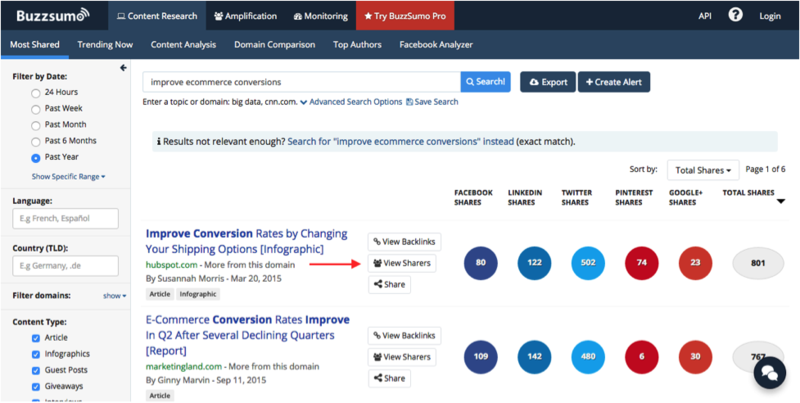 Another one of BuzzSumo’s great features is the ability to see who shared a piece of content and how popular they are on social media. To do that, click on the “View Sharers” button (requires free trial or subscription) and research which influencers are interested in your topic. Do this for a few different pieces of content and you’ll have a great place to start when doing outreach for potential speakers. The final step after determining your topic and speaker is to establish the goals and metrics you will use to measure success. Goals can include anything from greater brand awareness, generating leads, or simply engaging current and future users with valuable information. Whatever you choose to focus on, make sure to stick with it, as it will also play a big role in how you develop the presentation. Regarding metrics, if you have a previous webinar to reference, consider aiming for something like a 5% increase across the board. Assuming your previous effort didn’t flop horribly, this shouldn’t be too hard to achieve. If this is your first webinar, consider some metrics that are a bit more open-ended like “50% of attendees will stay for the entire webinar” or “75% of registrants will engage the Thank You email by clicking on a link.” Using metrics like this will give you something to work towards without punishing you too hard if attendance is less than stellar. Now that you have picked a topic, named it, and secured a speaker, it’s time to market it. In order to reach as many potential attendees as possible, you will need a strategy that is both consistent and spread across multiple channels. Don’t make the mistake of thinking SEO is only important for traditional content. It can have a huge impact on your webinars as well, especially when coupled with a quality blog post. 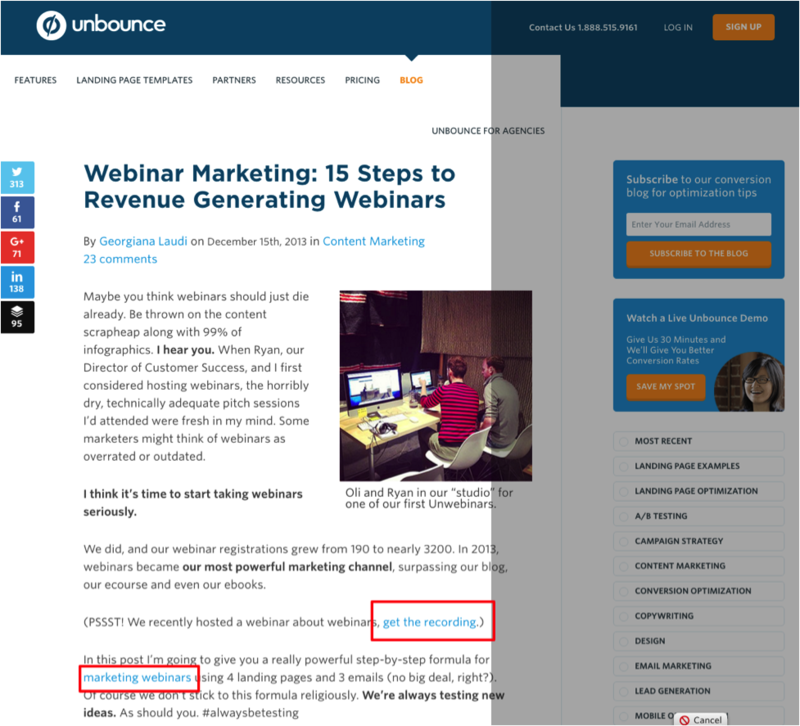 Remember, if you use either of these tactics, make sure to go back after the webinar is complete and update the links to the recording as sending traffic to the landing page won’t do you much good. Visitors to your site are your ideal webinar attendees as they have already demonstrated an interested in your company and services. However, you can’t assume that they regularly read your blog or follow you on social media so it’s a good idea to update your site to get their attention. 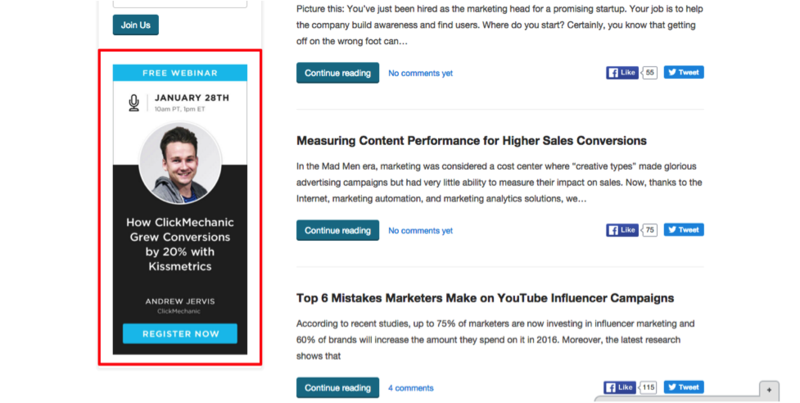 Sidebar ads are a great way to promote a webinar without being too intrusive. Plus, they usually have the added benefit of appearing on every page and creating effective awareness. 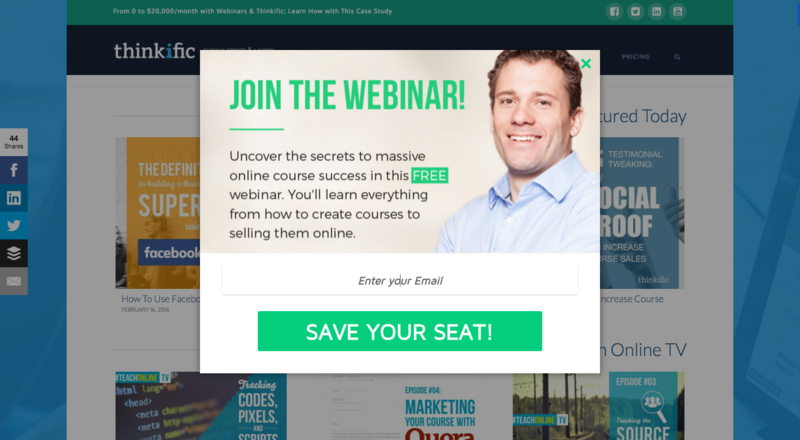 Popups allow you to put a message in front of a user at a specific point in their session. Tools like OptInMonster let you target specific pages, durations, or exit intent, ensuring the right message gets displayed at the right time. The thing you want to be careful with regarding popups is making sure you know your audience and which popups they respond to. I personally have never opted into anything via a popup and generally find them annoying, but many find them invaluable. Plus, when there is so much being written about their benefits, I think they are definitely worth testing. If you have done a webinar before then you should already have a page where users can read a summary and watch the recording. If this is your first attempt, then at the very least put up a page where you can list upcoming webinars and consider linking to recordings that you think your users will find valuable. 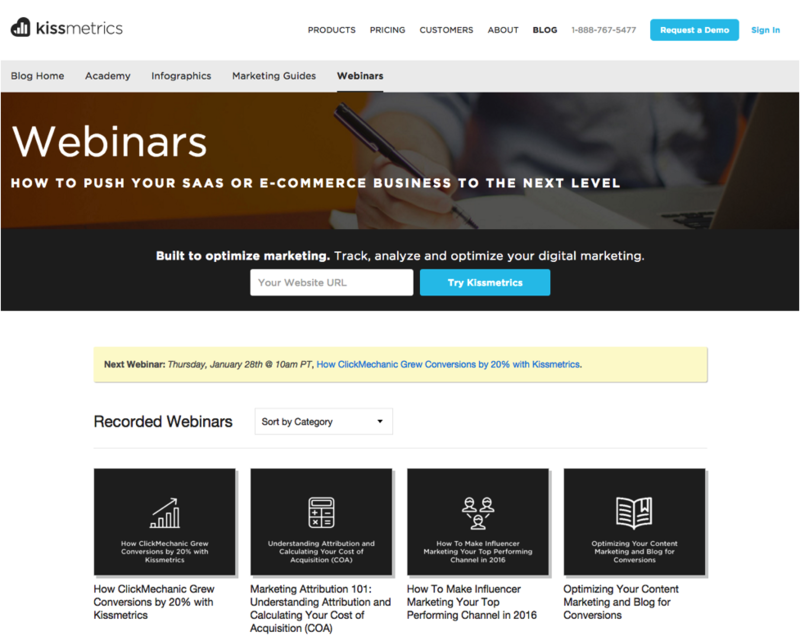 Once this is all setup, make sure to highlight your future webinar like Kissmetrics so that it’s one of the first things a visitor sees. Social media is the last piece of the promotion and marketing puzzle for your webinar. Establishing a clear and consistent plan of attack will not only get the word out to your current followers but also make it easy for them to share and engage your posts. Establishing a hashtag and using it across all your social profiles will have two main benefits: it will allow you to better track engagement and help with branding. 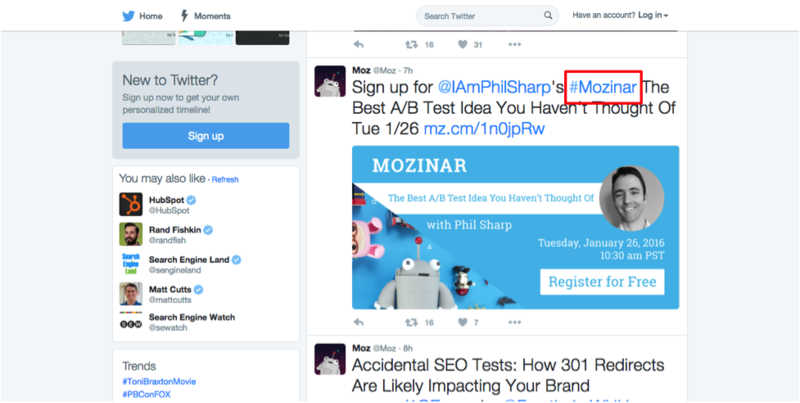 If you’re like Moz and offer webinars often, consider going with something broad that can be used every time. If you are planning a one-time thing, be more specific with your hashtag and incorporate your title. Now is not the time to be shy with your social media. Your potential attendees prefer different networks, log on at different times, and respond to different messages so make sure to diversify your efforts. The usual best practices apply here, post daily while mixing up the copy, graphics, and CTA (but don’t forget to include the aforementioned hashtag!). Also, make sure to recruit your webinar partners and speakers to help you reach even more people. Pro Tip: Use Hootsuite or Buffer to schedule posts across multiple profiles. Pinning a tweet ensures that no matter how often you post, that one message is always at the top. 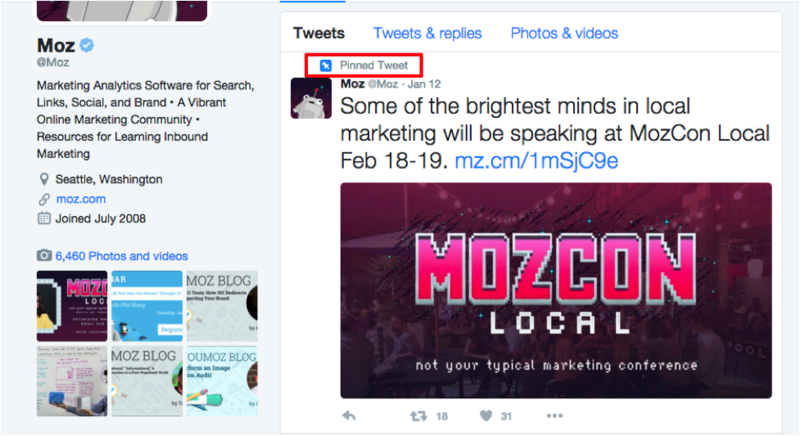 Moz already posts about their events daily, but utilizing this feature ensures that this is the first thing a person sees when checking out their Twitter feed. 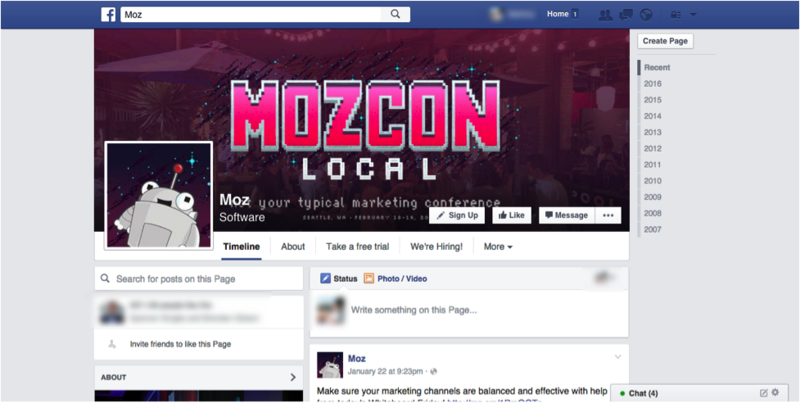 They do something similar on their Facebook page but, this time, they have changed the banner to reflect the event. Same goal, different tactic. Pro Tip: Use Canva to easily create graphics for Facebook and Twitter. If you want to squeeze as much as possible out of your social media promotions, considering boosting your posts with ads. With the new lead ads from Twitter and Facebook, you can get people to sign up for your webinar without leaving the social networks. 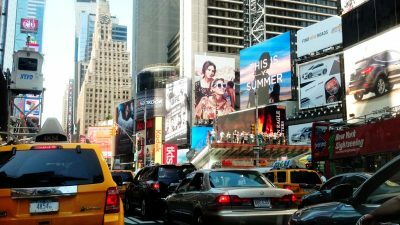 For Facebook, experiment with video ads to stand out and reduce your cost per lead. By now you should have spent considerable time finding a topic and determining how to market it – it’s finally time to bring it all home. 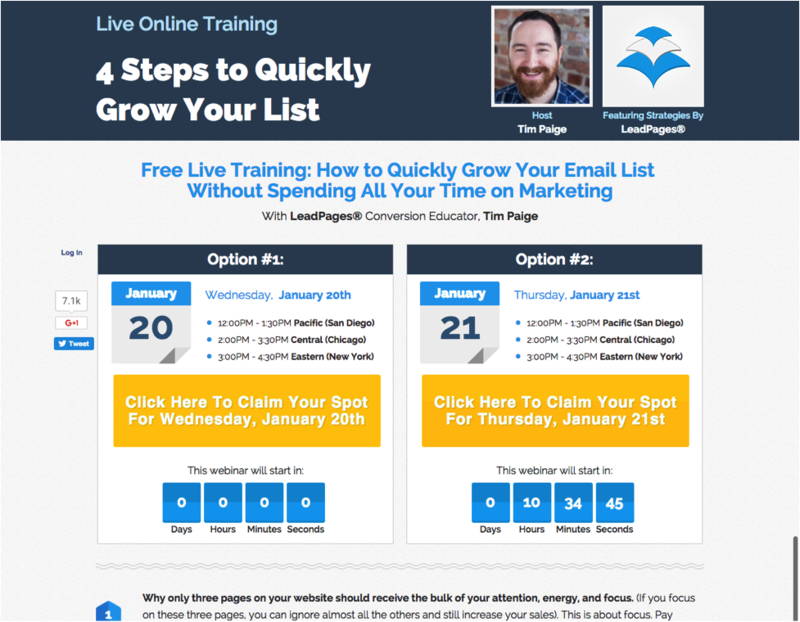 Remember, your goal is to maximize the number of people that view your webinar, so all this planning is for nothing if you can’t get them to commit. You knew this was coming, right? What good is having the best topic in the world and the ability to market it effectively if you can’t make them convert? 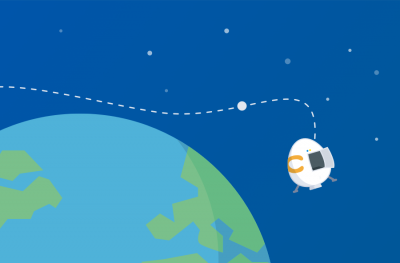 A quality landing page is the last piece of the puzzle and can make all the difference when done correctly. Yes, the concept of benefits over cost most certainly applies here. Attendees are giving you both their email and time, they deserve to know that what they are getting in return is worth it. 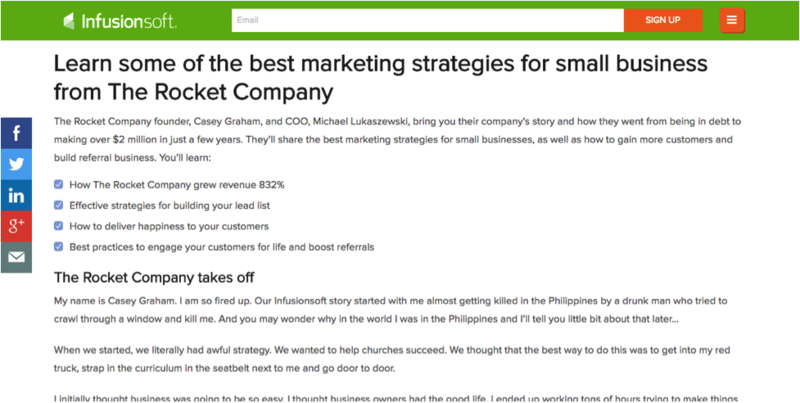 The Rocket Company does this really well by explaining with what the webinar will cover (including some metrics to drive home the value) and closing with a story that I want to hear the rest of. They are missing a few key details, but this is very well done when it comes to providing value. The first should express your appreciation for their signup, remind them of the details, and include links to information such as the speaker’s social media accounts (Pro Tip: Use reservation schema to increase the chance of the event syncing with their calendar automatically). The second should be a reminder sent a day or two before the webinar and should be brief but also include the relevant details (time, link to join, etc.). The third should be another reminder just as the webinar is about to begin. The fourth should be sent as soon as the webinar recording is available and include the applicable link, a thank you message, and a means of providing any feedback. Convincing a person to attend a webinar is not an easy task, but it is the first step in making sure your event is a success. This post didn’t even touch on how to effectively design and deliver a presentation, but it did lay out the process of establishing a proper foundation. In my experience, a webinar always builds on itself. When you know more people are attending, you’ll work harder to deliver a quality presentation. When people find value in the presentation, your company will reap the benefits. 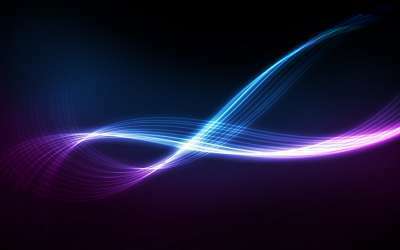 Everything is connected and dedicating enough time to this first step will pay off long after the webinar is over.